Between olives I've been served at restaurants as a starter and various brands of olives I bought in supermarkets I have found that the ones in restaurants often taste much better. In particular they are often less salty, less bitter and more buttery in taste. Is this a bias on my part, maybe because I tend to be more hungry when I go to a restaurant or are they actually better. Are there particular varieties of olives (eg. specific region or method of preservation or preparation) that taste like the ones in restaurants? Is it that they are fresher at a restaurant? EDIT: I'm referring to plain olives here, not a processed. The kind you get as a starter, sometimes with some bread on the side. In particular mediterranean or middle eastern restaurants serve them that way. In comments you note that you last bought a jar of green, pitted olives in brine. Those tend to be much saltier than the versions served as a mezze in Mediterranean and Middle Eastern restaurants, in part because the restaurant versions are usually whole and thus have less surface contact with the storage brine. They're also fresher; restaurants that go through larger quantities of olive can afford to purchase higher-quality olives that haven't been sitting in their brine on a shelf somewhere for months (or years). Olive variety may also be a factor. The picture you've provided looks closest to me to a Castelvetrano olive, which have a very mild, almost buttery flavor. This mildness comes from its processing, which is close to the preparation of the black California olives familiar to Americans. They're washed in a lye solution, which flushes the bitterness of the fresh olive, and are then rinsed to remove any traces of lye; they can then be brined for a short period of time, but they're typically much fresher and less salty than other olives. I know a few chefs who like serving them as a starting course specifically because they're not overwhelmingly salty. As others have suggested, you can seek out similar higher-quality olives in bulk at boutique grocery stores. You'll have to pay a bit more for the privilege, but the other advantage is that such stores are usually happy to let you try some of the varieties before you buy. Assuming that you are buying from supermarket shelves,(and not, say, from olive bars that some supermarkets have) there is a quality difference between shelf-stable canned and jarred olives vs. olives available in olive bars like Whole foods or in a Mediterranean deli. These come oil cured or submerged in water, and cannot be stored for long term, and they taste much better. I will remove a few cups of olives for short-term consumption and place them in fresh water, in the fridge. I drain and replace the water every 12-24 hours, and start tasting them (now that this is established practice) after 3-4 water changes (initially, I checked with every water change) until I get in the realm of a salt level I like, and then drain the water and don't refill, letting them sit typically another 24 hours to redistribute the remaining salt evenly. Based on the color of the water draining off, I'd have thought all the flavor would be gone with it, but this is not actually the case, and I do manage to achieve less-salty kalamatas that I enjoy far more than the very salty ones straight out of the keg. Your restaurants may be processing/marinating their olives in a similar manner (and possibly also doing things like adding some flavors, wine, etc.) 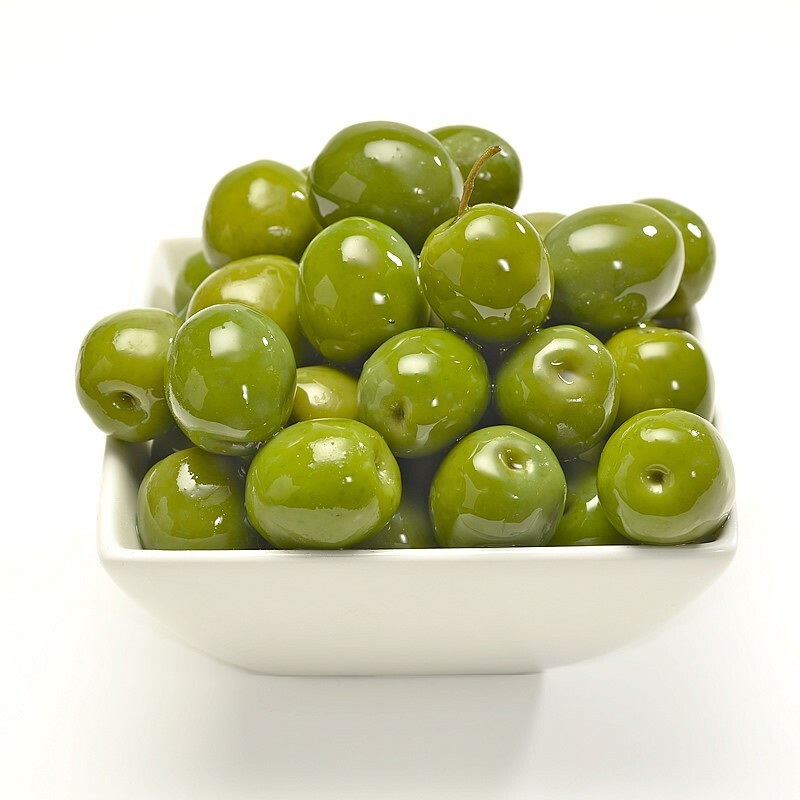 - or it may be the different sourcing of olives (or indeed, that they are kalamatas and not the typically far blander green or black olives; though your picture is definitely green olives.) I do find a number of search results when I search "marinated green olives" so you might follow that path if the green ones are your goal/ideal. I can in any case recommend fresh water soaking as a viable means for reducing salt level. European olives are not salty. I hardly was able to find any salty olives in europe. Only americans and asian countries who doesnt know how to eat olives eat salty olives. That is the only difference. Salty olives exist everywhere but in europe, non salty olives are very easy to find and tastes so much better and does not ruin ur taste when eating with pasta and other stuffs. Not the answer you're looking for? Browse other questions tagged flavor vegetables restaurant-mimicry olive or ask your own question. How do I mellow out the saltiness in black olives? Why does raw celery from a restaurant taste different than raw celery at home?